Chagrin Saddlery Mobile Announces Winter Location at World Equestrian Center's Vendor Village. 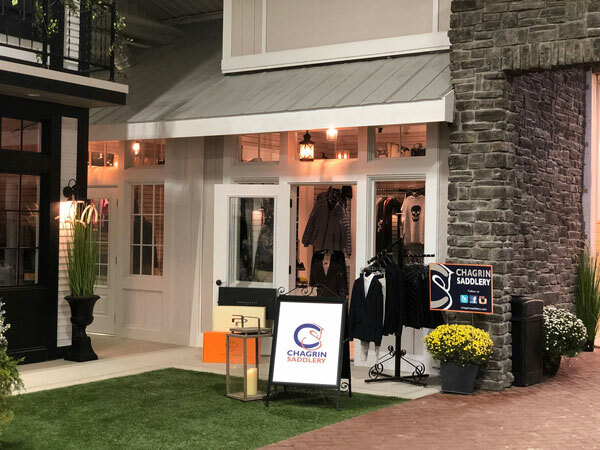 After an exciting summer on the World Equestrian Center/ Chagrin Saddlery Mobile Boutique at some of the country's top shows, Chagrin Saddlery Mobile will spend the winter in World Equestrian Center's Vendor Village. This beautiful new location features a clean, modern, rustic feel and offers a carefully curated selection of gorgeous hunt coats, show shirts, schooling apparel breeches, helmets, tall boots, accessories and gifts from coveted brands such as For Horses, Samshield, Tucci, Equiline, Fabbri and as well as toasty warm Skull Cashmere sweaters.. Styled as a boutique, a unique shopping experience combined with extraordinary customer service will leave you feeling like and old friend by the time you leave. From half chaps to paddock boots or stock to full custom tall boots, we can make your vision a reality. Best selling brands, Tucci, Parlanti and Fabbri will delight you with comfort, fit and style. Stop in and try on a pair. You might leave with one too! Need a new helmet? Perhaps a GPA First Lady or Samshield Shadowmatt. Our experienced helmet fitters will make sure your new helmet not only looks amazing but keeps you safe in the saddle. Fluffy equestrian themed pillows and crossbodies, Snaks Fifth Avenchew horse treats in seasonal themed shapes and colors, cell phone covers and pop sockets from Spiced equestrian and so much more await at Chagrin Saddlery. If you visit World Equestrian Center, stop in and check us out. The Vendor Village at World Equestrian Center is a shopping and dining destination featuring everything you could want at a horse show in a quaint, village square style setting. Complete with charming storefronts, paved walkways and sumptuous seating areas, the Vendor Village transports visitors to another place and time. Exclusive shopping, dining and day spa experiences are all conveniently located in the center of the horse show complex. All of these upscale amenities are within a minute’s walk of the horse show action in each of the competition arenas or within a short walk to the barns and onsite accommodations.